I’ve been demoted to the side bench as my bed! Because I was asked to stay and we have invited additional people on board, the boat is now full. Unless I want to sleep with the captain, I’m sleeping in the communal area amongst the boxes of apples and oranges! We very kindly got all the fruit and veggies donated by Eosta, organic but passed their sell by date, so everyday there’s a bit of an apple rummage to avoid the mouldy apple. 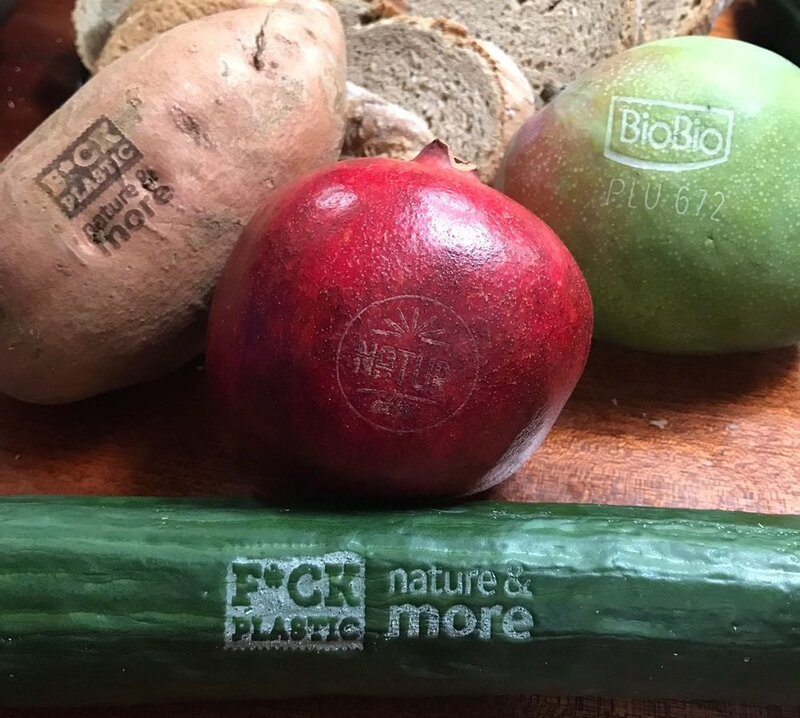 The best thing about this fruit is the labelling, engraved 'f*ck plastic' so plastic free but still branded. In fact, it’s incredible what we’ve been donated, mostly organic, or plastic free, but even as a boat of plastic aware people, who have made an effort, we still manage to produce a bag or recycling, every other day. Even if we are hugely conscious of our purchasing, it’s still virtually impossible, particularly on a large scale. I’ll write about alternatives in a later post and what we can do as individuals to make a difference. Of we set from Skagen (pronounced ska’en) south towards the Roskilde fjords. A day of clouds and winds and then sun and winds but in the wrong direction. When sailing hasn’t been possible, we go on the motor, aiming for an average of 5knts. We trawl for plastic - no joy but it’s a weird thing because, with all the effort that goes into it, you kind of hope to find some! I’m still addicted to picking out minute pieces from my bowl of Croatian beach, which is serving nicely as a distraction to blog writing and answering emails! Half way up the Roskilde fjord, the boat grinds to a halt, stationary, stuck, going no where. Mmmmmm how does one move a boat of 24 meters, when it’s stuck on the bottom? I’d just like to point out that this wasn’t the fault of the captain or skipper on duty, but that of the dry summer. The river was lower than it is normally on the charts. We all go the right and rock back and forth, push the engine into reverse, and hoist the sail to use the wind to help lift the boat. After about 10 minutes we eventually have FREEDOM! We continue, cursing the Danish fishermen for their illegal nets and poor channel marking. The boat grinds to a halt, stationary, stuck, going no where. We repeat our actions. Lean out the side, back and forth, sail up and FREEDOM! We are through the main bottleneck and the end is nigh. The boat grinds to a halt, stationary, stuck, going no where. We repeat our actions. Lean out the side, back and forth, sail up and FREEDOM! Yes, this may seem like a copy paste mistake but it is indeed true, we ran aground three times!! By the time we rock up in the harbour, we have the Danish anthem blaring from our boom box and the Cpt Huub, carefully manoeuvres the ship, bit by bit, in front of a crowd of locals and tourists.. joking, that this was because they’d heard about our disasters coming up the fjord! The parking up was impressive and a success, Huub was forgiven! Beers opened and then, out of the blue, in rock the Harley Davidson’s! Keeping up my role as entertainer, I suggest I am going to ask for a photo of me and a Viking on a bike. The next thing I know, I am being taken for a short ride around the local harbour roads, arm around the waist of the largest rider, with my short beach sarong showing a little too much thigh. I think this was a nicely symbiotic relationship! The night continues, a few beers, helping with the last trawl (that also collected half of the fjords sea grass, and so 6 hours later was still being sorted. Some general laughing, banter, and bonding. The team seems to have worked amazingly. Many different characters yet a team that seems to be able to work with everyone’s positives rather than the other way around. Perfect and I feel everyone is really happy. No arguments, no tensions, nothing. A purely bonded team. Perfect.